"If you see an Ogre, you know you're close to something the Hive values." Telthor, Unborn is a Hive Ogre who guards the Chamber of Night and is the mission's final boss. As an unborn Ogre, Telthor must prove itself to become reborn by protecting the Chamber and ensuring that the ritual continues. Telthor, Unborn will spawn after killing the three Siphon Witches and defeating waves of Hive. The Ogre will constantly charge at the player and try to crush the Guardian to the ground and will fire void beams from its eye like any other Ogre, so the player just needs to avoid it and focus it down until it perishes. 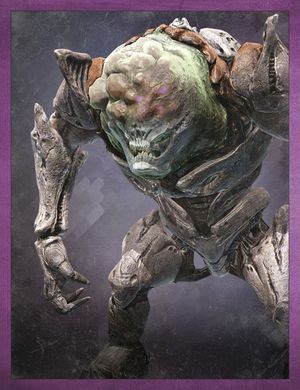 Telthor is the only unborn ogre seen in Destiny.